I'm sorry, every time I say "New York City" I say it in that super redneck voice from those salsa commercials back when I was a kid. That's just how I hear it. Way to go marketing. I had been a few times and was excited to show them what little I knew about the city. So we packed up from Sturbridge (leaky gray tank and all) and headed to Liberty Harbor RV Park - the only place to park an RV park anywhere remotely close to New York City. Situated across the bay in New Jersey, it was basically a big parking lot with power and water, but no sewer hookups. Which is cool, cause the whole point is you're going into the city each day to explore. Our trip to the park was kind of stressful because of the direction we were coming. We had to figure out ways around several tunnels and bridges that weren't high enough for our rig - and then got lost in the maze of interstates over on the NJ side, missed an exit and added like an hour to our drive trying to get back to the right road. Also, driving a 37' rig through downtown streets is just not fun. But we made it and got in our spot with minimal fuss. After meeting our neighbors (Ainsley's Angels) and learning about the amazing work they were doing, we decided instead of crashing for the night that we'd take the kids to see Times Square at night. I'm still torn on whether this was a genius idea or a terrible one. Either way it's one we won't forget soon. First of all, we had to ride the subway (it's really hard to find a cab that holds 6 people) from New Jersey. It was all kinds of complicated. But the kids had never been on a subway before! They loved trying to keep their balance as it started and stopped. Then instead of taking the next train all the way to Times Square we decided to walk like 2 miles. We did stop for ice cream along the way, where the kids saw their first homeless NY guy laying on the ground. Jett was a little weirded out and had trouble averting his eyes. We finally made it, and the while the kids hadn't been too impressed up to this point (the city can be pretty smelly and dirty), the crazy lights and buildings definitely got their attention. We wandered around and ended up in the massive Toys R Us store where Ada had to ride the ferris wheel inside (of course). On our way back, it started pouring rain, so we even got that whole "drenched in the city" experience. By the time we rode the subway back to NJ it was after midnight. We were exhausted, but adventured! We rolled out of bed pretty late the next morning, completely overwhelmed by what to do next. There's sooo much to see in the city, and we were only going to be there 2 full days. 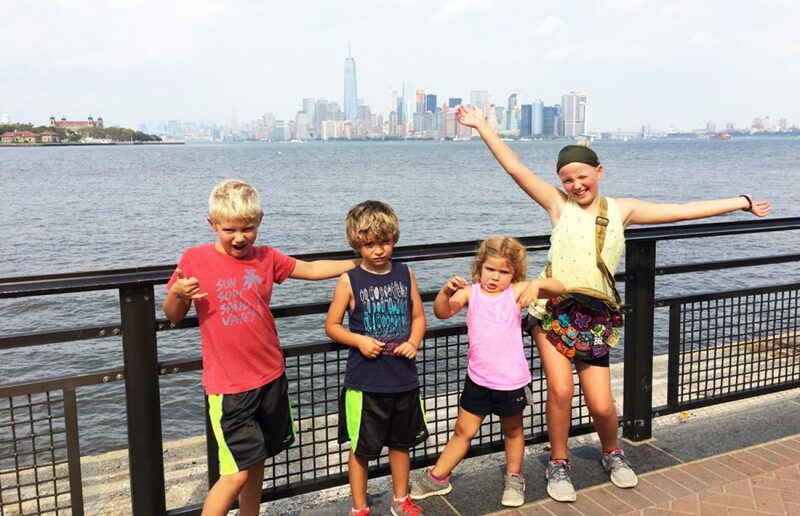 We finally decided to do the Statue of Liberty and Ellis Island ferry, grabbed some tickets online and headed out to grab some lunch before it departed. We ran into a small snag here - the RV park advertised a Ferry that would actually take you all the way into NYC if you didn't want to take the subway. Unfortunately the small ferry that was supposed to take you across the water (it was maybe 300 yards) to the main one was shut down completely for construction. And the only way to get all the way around was to walk like 2 miles! The ferry to the Statue of Liberty was leaving soon, and there wasn't enough time to make that hike. Cabs were pretty scarce in New Jersey at 11am on a Monday morning so I decided to try Uber. Uber's been making lots of headlines lately (and not for many good reasons), but we were pleasantly surprised by the whole experience. Our driver found us quickly and took us exactly where we needed to go. And he had room for all of us! We made it across on the ferry with no puking(!) and stopped at Ellis Island. We learned quite a bit about the varying phases of immigration in America and then got on the next boat to Miss Liberty. It's hard to describe the scale of this statue. Having only ever seen it on TV from across the bay, we were all struck and just how big she was. The whole island - while a little touristy - was really nice and had great views of the city. The only bad thing I can say is the tourists up on the pedestal were really inconsiderate what with their selfies peace sign pictures and whatnot. There wasn't much room to begin with and they were just all in the way. But seeing Lady Liberty up close was totally worth it! The final ferry we had the option to go back near our campground or go into NYC. It was still pretty early so we took it to Battery Park and started exploring the southern tip of the city. We found the Charging Bull - but again the crazy selfie tourists kept us from getting any decent pictures. Working our way north again, we ended up at the M&M store so the kids could see what all the fuss was about and grabbed dinner from a hot dog vendor in Times Square. Are we doing it right, yet? Determined not to get back home at 12:30 again, we hopped on the subway back to NJ. Side note - why is everyone so sad on the subway? Our kids were laughing and having fun and no one even cracked a smile. Get it together, NY! Don't be so grumpy! Walking back from the subway station we saw a sign for gelato! And not just any gelato. Bucket & Bay took such great pride in what they did. There was even fresh mint and basil growing in the kitchen. Watching them scoop even a kids ice cream cone was like watching a work of art being created. It was soooo good. I got mango and Ashey got strawberry basil. The decor was beautiful, the food was sustainable and amazing, and the vibe was great. In short, Bucket & Bay gets two thumbs up from all of us. Highly recommended! I love running across little gems like this. The next day our goal was to explore Central Park. If only it wasn't 100 degrees outside... Seriously, we tried to have fun, but it was miserable out. Add to that my wonky GPS on my phone, lame walking directions and everyone just wanted to find somewhere air conditioned. We roamed around until we found the Central Park Zoo and took advantage of the penguin exhibit! I have to say - when traveling lots of people suggest museums or zoos - but in the case of zoos in particular if you've seen one they're usually not that different. Thankfully, there were a few really cool exhibits (the sea lions in particular were a lot of fun) and Jett even recognized the iconic Delacorte clock from the Madagascar movies. After the zoo we were still miserably hot so we walked over to the glass encased Apple Store at 5th Avenue and chilled (literally). Then we grabbed some dinner and met up with my good friend Brandon and got some more ice cream (3 ice creams in 3 days - what's wrong with us!) and headed back to get packed up. And that was it - a whirlwind tour of the big city! Next time - we stay longer than 2 days and make sure it's not a million degrees outside. Now it's time to go get our gray tank fixed!